The 2013 Oscars have garnered an inordinate amount of attention – even when considering its steeped history of glitz, glam, unexpected triumphs and much-anticipated clean-sweeps. This year’s award ceremony will take place on Sunday 24 February, and be hosted by Seth MacFarlane of Family Guy fame. Box office takings – the total takings for each film since its release date in the USA. The theory is that those movies that enjoy greater ticket sales at the box office have a greater chance of winning Best Picture. The critical rating of nominated films via online review site Rotten Tomatoes and popular opinion forum Metacritic. The number of relevant accolades achieved – Golden Globe wins and Oscar Nominations. The latest betting prices offered by Hollywood Stock Exchange, Intrade and Betfair. The 2013 nominees for Best Picture at the 85th Academy Awards offer a truly eclectic mix of genre, directing and acting. While office banter lingers on cult director Quentin Tarantino’s return to formidable form with the almost indescribable Django Unchained – an inimitable take on the attitudes, characters and caricatures at the height of American slavery throughout the Deep South and Old West – popular critical acclaim has identified two standout candidates in 2013. Ben Affleck’s dramatic recreation of the 1979 Iranian hostage crisis in Tehran, Argo, has received seven nominations and won Best Picture and Best Director at the Golden Globes. The film has attracted widespread critical acclaim for its uncannily accurate reconstruction of the people, events and places involved in the 1979 standoff. Lincoln, another historical drama, revisits the presidency of Abraham Lincoln – the 16th President of the United States – focusing on his struggle to abolish slavery. The 1865 mêlée to pass the Thirteenth Amendment received the most nominations (12) at the 2013 Academy Awards. 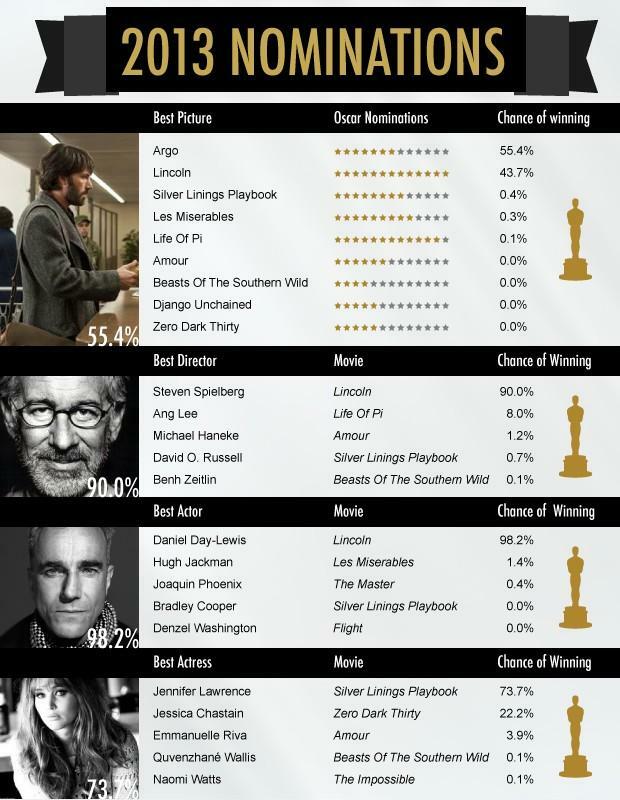 Aside from Best Picture, Lincoln also has a chance to take-out Best Director (Steven Spielberg) and Best Actor (Daniel Day-Lewis). The film also banked a handsome sum, grossing over $235 million at the box office. Curiously, Affleck – who directed and starred in Argo – failed to receive a nod for Best Director, despite his film being a hotter-than-hot contender for Best Picture. Directing great, Spielberg, is the runaway favorite, with the seven-time nominee and two-time Best Director winner tipped to add to the trophy cabinet in 2013. However, Ang Lee’s adaptation of Yann Martel’s 2001 novel, Life of Pi, remains a sneaky outside chance in this year’s Best Director category. The film won over many fans within the industry and worldwide movie-going public for its amazing use of 3D effects and captivating storytelling. Life of Pi racked-up over $564 million in ticket sales and received eleven Oscar nominations. Daniel Day-Lewis is gunning for his third Best Actor statuette for his role as Lincoln in the creatively named film – Lincoln. Even Hugh Jackman’s career-best performance as heroic nineteenth century French figure, Jean Valjean, in Tom Hooper’s Les Miserables seems unlikely to deny the apparently unstoppable Day-Lewis express. Still, Jackman’s first Academy Award nomination for Best Actor isn’t without hope, having already claimed this year’s Gold Globe for Best Actor in a Musical or Comedy for the same performance. The Best Actress category at this year’s awards is a little more open – as is often the case when Meryl Streep isn’t expected to overshadow the credentials, and extinguish the dreams, of her rivals. Jennifer Lawrence has had a remarkable breakthrough 12 months. While her most popular movie of the last cinematic calendar year – The Hunger Games – wont feature at the 2013 Academy Awards, her portrayal of the emotionally dysfunctional Tiffany Maxwell in Silver Linings Playbook (8 nominations) has left many industry insiders expecting her to claim gold on Sunday night. Emmanuelle Riva (Amour) and Jessica Chastain (Zero Dark Thirty) also remain firmly in-the-hunt. But all the tears and tribulations of the nominations can be a little too serious. So to ease the tension, we thought we’d take a look at the lighter side of the film industry’s night-of-nights. The Statuette: Firstly, the Oscars don’t just carry significant industry weight – they’re actually pretty hefty pieces of cabinet bling. Each Oscar statue is 13.5 inches tall and weighs 8.5 lbs – the same weight as 250 dvds. But, it seems that the Academy may be compensating, as the Oscar statuette isn’t actually made of gold. It’s comprised of an alloy called ‘Britannia’ – 2% copper, 5% antimony and 93% tin. Oscars and the war: During World War II, metals were desperately needed to underpin the manufacture of military-related goods. Oscars during this period were made from plaster, with winners able to trade-in their award for a shiny new statuette post-war. Longest Acceptance speech: A great speech can be uplifting. A long one, however, can be painstakingly arduous. Greer Garson’s acceptance speech, for her role in the 1943 Mrs Miniver, lasted over 5 minutes. The Only Oscar to Win an Oscar: Oscar Hammerstein II belongs to a very exclusive club. He’s the only Oscar to win an Oscar, securing an Academy Award for his song The Last Time I Saw Paris, which featured in the 1941 film Lady Be Good. Jane Wyman (Best Actress in Johnny Belinda (1948)); Sir John Mills (Best Supporting Actor in Ryan’s Daughter (1970)); and Holly Hunter (Best Actress in The Piano (1993)). The greatest of them all: Walt Disney has won more Oscars than anyone else. He was nominated a staggering 64 times, winning a total of 26 (22 competitive, 4 honorary). Refusing Oscar: Only three Oscar winners have refused to accept the award. Dudley Nichols won Best Screenplay for The Informer in 1935, but ignored the accolade due to ongoing disagreements between The Academy and Writer’s Guild. George C Scott’s disdain for the awards ceremony – which he described as “a two-hour meat parade” – saw him reject his statuette for Best Actor in Patton (1970). Finally, the infamous Marlon Brando vetoed his award for Best Actor in 1972’s The Godfather, citing Hollywood’s discrimination of Native Americans. X-rated winner: Midnight Cowboy won the 1969 Academy Award for Best Picture – the only X-rated film to claim an Oscar. Outstanding results: The 1997 instant classic, Titanic, received the most nominations for single film (14), winning the equal most awards (11). 1959’s Ben-Hur (11) and 2003’s The Lord of the Rings: The Return of the King (11 from 11) share the Oscar leaderboard alongside Titanic. But ‘outstanding’ doesn’t necessarily mean good. Two films tie for the record of the most Oscar nominations without a single win. Both The Turning Point (1977) and The Color Purple (1985) received eleven Oscar nominations, but won not a single Academy Award. 2013 Oscars: A full-gone conclusion? So, as you settle into that familiar sag in the couch to enjoy 2013’s ‘meat parade’, what are your award night certainties? Is falling asleep at the halfway mark a sure thing? Is it inevitable that the leading ladies will flash a little too much flesh? Are Steven Spielberg and Daniel Day-Lewis assured of victory? Or will Seth MacFarlane attempt to abuse his hosting privileges and redress the commonly held belief that he’s a sadistic sycophant? Who knows? You might just have to watch it! See you on the red carpet.